Uttar Pradesh is famous for a variety of street food snacks like samosa, kachori and chaats. One street food snack that requires special mention is the Banarasi Chura Matar aka Poha Matar (beaten rice flakes with green peas) that is very popular during the winter season when green peas are bountiful. 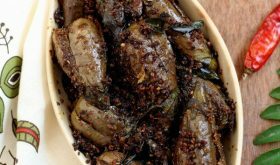 A versatile alternative to rice is beaten rice flakes aka chura as it is popularly known parts of Northern Indian especially in Bihar and Uttar Pradesh. 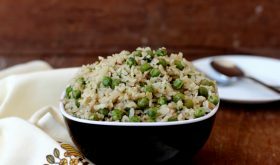 In the Chura Matar recipe that I have adapted from Sangeetha’s food blog, poha (chura/aval) and green peas are the major players with minimal spices going into it. There is something magical about the flavor and texture of this ‘no onion no garlic recipe’ and it is a pleasure to relish it on a cold winter morning with adrak wali chai. Poha that is soaked in milk and green peas are tossed in aromatic spices along with lots of fresh coriander. The flavor combination is addictive while the beautiful round gems add a wonderful color and texture to this easy to make snack. Put to good use the seasonal fresh green peas and make this no fail dish and serve it for breakfast, or as an evening tiffin or dinner. Wash poha and drain completely. Place the poha in a vessel and add milk. Mix well and set aside. Heat ghee in a vessel, once hot, add the cumin seeds and allow to splutter. Add ginger green chili paste and asafoetida and saute for a few seconds. Add the chopped coriander stems and green peas and saute for 3 mts on low flame. Add a cup of water, salt to taste, black pepper powder and sugar and bring to a boil. Reduce flame and place lid and cook till the peas are cooked and the water is almost evaporated. Add the milk soaked poha and fresh coriander leaves and mix well. Place lid and cook on low flame for 5 mts. Sprinkle little water if required. Add garam masala and lemon juice and mix well. Turn off flame and serve warm. For a richer flavor, add 2 tbsps of cream along with milk while soaking the poha. Amchur powder can be used instead of lemon juice. By Sailu Published: December 6, 2013 Chura matar recipe is among the easy to make snacks of North India. 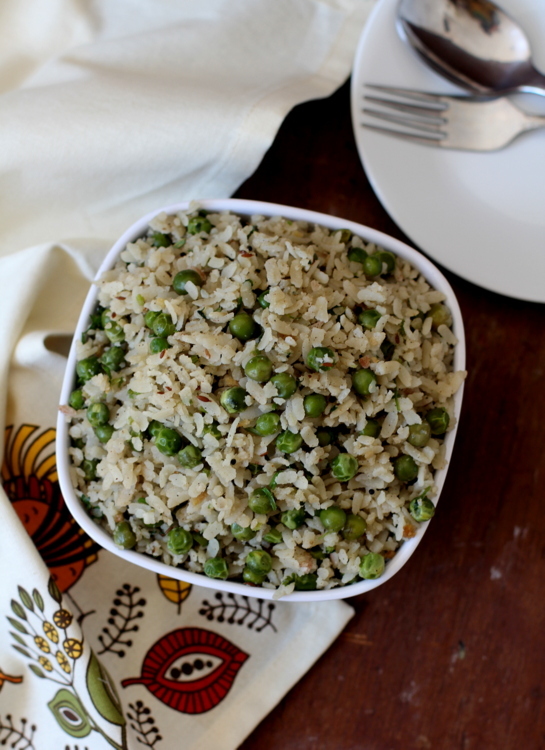 A Banarasi style poha green peas breakfast that has garam masala and fresh coriander. Looks delicious. My next morning breakfast will be this one. Thanks Sailu. Everytime I try and soak poha it combines into a gooey mass and lumps are formed. When you add milk and set it aside how do you get these separate poha grains as shown in the photograph. Vikas, you have to use the thick variety of poha and not the flat and thin variety. The thicker variety absorbs the liquid well and holds shape unlike the flatter poha which becomes a gooey mass. I usually buy this variety in the local farmer’s market and not the stores since most stores stock the flat thin poha which is whiter in color compared to the thick variety. Thanks a lot. That explains it. Now to figure out where to buy the thicker variety in Delhi. But, you recipe says to use thin poha,.. Turned out really well. Delicious.